Being at the helm of affairs, how do you encourage society members to volunteer their time and effort for professional society, or even on the board? JB: I begin with the story I noted above describing how beginning as a reluctant volunteer with SEG turned out to be one of the most rewarding decisions of my professional career. I like to describe how volunteering in a professional society often leads to leadership opportunities much sooner than it would in their company. And I also like to stress how volunteering allows you to use your knowledge, experience and education to make a societal impact beyond what is possible in your workplace. For example, SEG’s program Geoscientists without Borders advances the humanitarian side of the geosciences and is a great place to give back and contribute to the larger global society. RN: I’ve found that both geophysicists and Canadians in general are outstanding in their volunteerism, so we doubly benefit within the CSEG. Personally, I find that there are so many good reasons to volunteer that it doesn’t take much to encourage someone to join in. Often you just have to ask. For the 2016 Executive Elections we had two people running for every position, and three for Director of Finance. Our members are always willing to step up and for that I am truly thankful. MA: Professionals within our industry, and any other industry for that matter, know best what it takes to accomplish goals to realize a common vision; they do this as part of their daily jobs. Why not go an extra step and leverage such know-how at a bigger scale by being part of an international professional society, either as volunteering ‘active’ members or by clinging a seat on the board? This gives them a chance, amongst other benefits, to pseudo-standardize the way business is done throughout the world, thus yielding a more prosperous life for mankind. And for students and young professionals, my message to them is that not only does joining a society at an early stage give you an edge, but also contributes towards making the future a notch better. Finally, here is little enjoyment I’d like to share – serving within a professional society brings with it a great deal of self-satisfaction. JH: In AAPG it does take a lot of effort to find volunteers. AAPG is both a scientific and a professional society, and many members give back to the profession through volunteerism. This leads from committee membership, to chair positions, to national level work on our Advisory Council or the Executive Committee. NM: This has never been a problem. Our most valuable resource is the tens of thousands of members willing to serve. My first boss viewed SPE as a social group and always served on the golf tournament committee. Service opportunities are abundant, fulfilling, and flexible enough that we can usually find something that fits a volunteer’s available time commitment. This is not really a significant problem. The present exploration and development scenario in our industry has changed a lot over the last two decades, as we have almost moved away from the conventional oil and gas production, more so in the western world. Our industry is now focused in deep-water settings, subsalt plays, shale resources and the like. How are professional societies catering to the training needs of the members, so that they are abreast of the latest technologies, techniques and workflows? JB: I see this happening in four different ways. First, our top tier journals like Geophysics and Interpretation are the publication venues of choice for research geophysicists developing applications for new directions in oil and gas resource recovery. Second, our conferences and exhibitions provide venues for companies to showcase their latest technology, and to stay abreast of the next frontier through interaction with the top researchers in the field. Third, our offering of continuing education courses is constantly evolving, and draws upon the substantial expertise that exists within our membership to deliver relevant and cutting edge material. Lastly, our research arm, SEG Advanced Modeling Corporation (SEAM) works in partnership with both industry and government to build models for development and testing of technologies to address the most recent challenges. RN: There are plentiful opportunities for formal, informal and self-guided training within the CSEG that are discussed below, but I’d like to focus on one section of the CSEG that I feel adds exceptional value to our members, the society, and to the industry in general. The CSEG Value of Integrated Geophysics (VIG) group has been working to “improve the understanding that we have, the things we do, and the level of integration with which we do them”. They are directly catering to the needs of our members by helping geophysicists show how geophysics adds values. As well as developing a VIG course for the CSEG DoodleTrain, and publishing a series of value-oriented articles in the CSEG RECORDER, the VIG committee has also been encouraging dialogue with the SPE. It is critical to the continued use of geophysics that geophysicists, geologists and engineers all understand, and can demonstrate quantitatively the value of geophysical technology. In addition to our GeoConvention partnership with the CSPG and CWLS, we have worked to build and strengthen relationships with many of our fellow societies, including the SEG, EAGE, and GSH. This has allowed us to offer additional training and networking events such as the successful 2014 CSEG-EAGE Land Seismic Workshop. MA: EAGE, now a prominent global player in the geoscience community, is applying all efforts to support the next generation of geoscientists and engineers. At the professional level, we are offering a whole host of services, workshops and courses, tailored specifically towards the unconventionals. Details and timings are provided on our portal. As for the youths, the EAGE Student Fund is there to support numerous activities including the emerging trend of unconventionals, with the Student Lecture Tour being one, allowing students to get top-class instructors to engage with them. These instructors dedicate an enormous amount of their time to visit each continent of the world to share their experience and expertise to all those who wish to enter this exciting industry and know about its new directions. We all share a goal of extending knowledge, especially as relates to new technologies, to further develop the industry and EAGE is a proven asset to all our members. JH: AAPG has a continuing education program that helps to maintain our members’ education on new technologies and techniques. Our Geoscience Technology Workshops, GTW’s, conferences and symposia focus on new and leading edge technology with world-class experts providing insight on leading pure and applied science. NM: SPE has many types of events. Large conferences like our Annual Technical Conference reflects current trends in the 2000+ full-length technical papers that will be considered for the few hundred presentations. Smaller events like workshops and forums can be organized quickly and focus on important trends. We offer professional training, and people “vote with their feet” so that the most important areas are the ones where we offer courses. This was true in the late 80s to early 90s as horizontal wells first became widespread and it is true today. The geoscientific/engineering workforce in our industry has a gender disparity in that there is a lower proportion of women. Are the professional societies/associations able to address this issue? If yes, what is being done to address it? JB: Yes, absolutely, the professional societies are able to address this issue, but I will say we have not done an adequate job to this point. Rather than reflecting the situation in the profession, we can take a proactive leadership role by becoming an example of diversity awareness and advancement. Let’s remember that the professional societies are also businesses that seek to maximize performance. Studies have shown that companies which strive for diversity at all levels in the organization perform better, so it is also in our best interest to push for diversity. To address the specific issue of gender parity within SEG, one of our past presidents Klaas Koster formed the SEG Women’s Network Committee (WNC), which works to raise awareness of and find solutions for the challenges women encounter in the field of exploration geophysics. Since its founding, the WNC has become one of our most active and successful committees and sponsors a number of events at our annual conference along with publishing regular articles on women’s issues in our monthly magazine, The Leading Edge. SEG seeks to ensure that women are provided leadership opportunities to the highest level and are nominated for the top awards given by the society, as well as providing mentor/mentee opportunities. We have a long way to go but are making progress. RN: It is notable that I am the only female president participating in this interview and that, with respect to the CSEG, I am the third female president in 66 years. In 2016, Marian Hanna will be the fourth, having taken the helm by the time this interview is published. Given the number of female geoscience students, I often wonder about the attrition, as my observation of my peers is that much of the talent either left or never entered the industry. As a scientist, I’d like to see statistics before commenting on how we address the perceived lower proportion of women in the industry: numbers of male and female graduates, along with early, mid and late career professionals; industry / geoscience exit interviews, including opportunities missed or passed by; salaries, mentorship, promotions and layoffs; business opportunities including training in economics, leadership, and management; networking opportunities, including participation in luncheons, petroleum clubs, golf tournaments, and other industry social events. For example, there is certainly a perception that women have been hit disproportionately during this recent downturn, but again, I haven’t seen statistics to support the assertion, nor explanation of the circumstances that may show that the specific layoffs were unrelated to gender. As a woman, I have a feeling that much of the attrition comes from lack of opportunity and support deriving from insufficient mentorship, sponsorship and advocacy. I sense that this is also the case for other minority groups within the petroleum industry. To address support through mentorship, sponsorship and advocacy for all our new members, the CSEG has a mentorship program run through the CSEG Foundation. For this to be a valuable resource for women, we require women mentors to also step up and volunteer, yet our women members are often giving so much of themselves already. Additionally, women moving beyond the first few years of their careers are not always provided the necessary support within their companies, so technical and professional societies could fill this gap. Over the past year I have become more familiar with women’s networking groups such as AWSN (Alberta Women Science Network) and WinSETT (Women in Science, Engineering, Trades and Technology networking forum) and met to discuss interaction with the CSEG membership and learn about ventures such as the AWSN Work Re-engagement Program. At GeoConvention 2016, a Workplace Culture/Diversity session included Diversity and the Corporate Culture in the Geosciences by Margaret-Ann Armour that highlighted the recognition by Canadian companies of the business case for retaining and advancing technically trained women. With action, we can increase sponsorship and advocacy for women in the petroleum industry so that we can all thrive. MA: EAGE is fully aware of the gender parity in our industry and finds it very important to address these issues. EAGE therefore has a special interest community for Women in Geoscience and Engineering. The Women in Geoscience and Engineering Special Interest Community (WGE SIC) has been established by EAGE to facilitate communication between women and to promote their active participation in this community in related activities. The mission of this group is to enable the exchange of knowledge and experience, and to facilitate mutual support among members, related to: better understanding of WGE community expectations; enabling advice between community members; sharing career opportunities; guidance on career development; and retention of women in the industry. JH: During my presidential year I have traveled significantly and met with both young professionals and students, and I was so happy to see that diversity in the geoscience community of millennials is going to change the way geoscience is done in the future. At AAPG we work closely with our PROWESS Committee, a strong group of women, who work with our young professional and student women. NM: This challenge is not one we can resolve just as professional organizations. We have had three women serve as SPE president, and my successor (Janeen Judah) will be the fourth. We are active in promoting STEM activities and many other things focused on encouraging women to join the industry. Janeen just had a global twitter chat on International Women’s Day and we are all concerned about attracting and retaining women in engineering. Our progress has been significant but not nearly good enough. A prominent role of professional societies is in promoting integrity in research. Besides this, the present day scenario in our industry calls for interdisciplinary cooperation which is a mix of both educational and informational. How are your societies / associations helping to achieve this? JB: I would add that the global professional society landscape is becoming more crowded, and it is critical for our organizations to work together in order to provide our corporate partners and members with the best set of opportunities and programmatic offerings. Perhaps the clearest example of this is in the interdisciplinary and cooperative conferences and workshops that we put on worldwide. This includes events such as the Offshore Technology Conferences (OTC), the International Petroleum Technology Conference (IPTC), the Unconventional Reserves Technology and Engineering Conference (URTEC), the SEG/ AAPG International Conference and Exhibition (ICE), and the Near Surface Asia Pacific Conference. In addition to these events, we co-publish the journal Interpretation with AAPG. 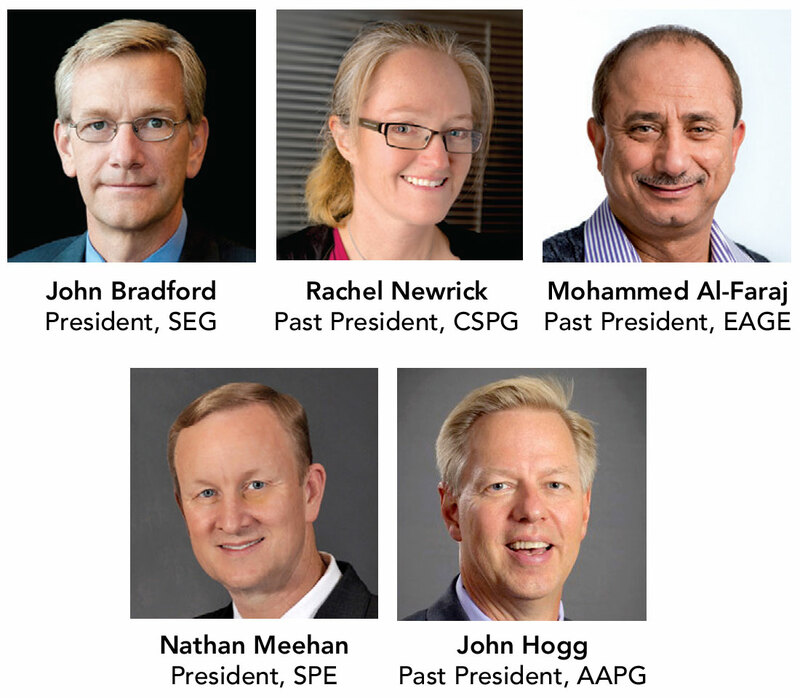 In the Middle East region, SEG, AAPG, EAGE, and SPE regularly meet to coordinate events and schedules, which serves as an excellent model for how we can work together for the common good. With respect to promoting and advancing interdisciplinary studies, SEG offers several programs including the SEG/Halliburton EVOLVE program, which is focused on helping students make the transition to young professional through working on interdisciplinary teams to address a technical challenge. Additionally, the SEG Advanced Modeling Corporation’s newest project, termed Life of Field, is designed to bring together geophysical, geological and engineering aspects of the upstream production of a field from start to finish. RN: We excel at interdisciplinary cooperation and have worked hard through the Value of Integrated Geophysics (VIG) group, the Emerging Professionals Program (EPP) and GeoConvention to engage geophysicists, geologists, engineers and other industry professionals so that we may all thrive. There is significant demand by our members for soft skills training such as resume writing, interview practice, presentation skills and networking, as well as interdisciplinary training that focuses on engineering, economics, and geoscience beyond petroleum geophysics. Since 2002, the CSEG DoodleTrain education week has been a key resource for members interested in effective training through 1-3 day short courses. Each year the scope has expanded, and in 2015 courses were offered for technologists, generalists and specialists on acquisition, processing, reservoir geophysics, rock physics, completions and stimulations for geophysicists, seismic geomorphology and recent sand models. Watch out for DoodleTrain each November, as it is one of the premier geoscience training weeks provided at an affordable rate. Since 2012, the CSEG Symposium has honoured notable CSEG members with a one-day event of talks on a theme related to the honouree. It is significant that the talks are not published so that case histories can more easily be presented. Additionally, the committee encourages presentations to be either interdisciplinary and/or to show the value of geophysics. In 2016, the Symposium posthumously honours Bill Nickerson, with the theme of Integrity, Knowledge and Wisdom. This is an event that I look forward to each year, and encourage all industry professionals to attend. MA: Many of our activities are interdisciplinary in nature. An example is a series of workshops that address interpretation where participants come from different fields including geophysics, geology, and IT. This is not coincidental as EAGE is intrinsically interdisciplinary, encompassing the two major branches of earth sciences (geology and geophysics) and related engineering (be it petroleum or simply classical); this is reflected in the name of our association. As such, the association is divided into two divisions, one undertaking deep subsurface focusing mainly on oil and gas (G&G and petroleum engineering), and the other near surface which includes mining, mineralogy, environment, archaeology, soil and agricultural studies, and so on. There are interdisciplinary projects undertaken jointly by the two divisions which we hope will benefit the industry, such as employing remote-sensing and other data-collection tools to assess ground compaction (subsidence) caused by sustained reservoir production. JH: We work closely as an association with both pure and applied science research groups around the world. Academic researchers are critical to both providing future geoscientists to our industry and cutting edge research for our members and the geoscience community on all aspects of geology. Being the president of a professional society / association is an opportunity to bring on some ambitious measures and implement fresh ideas that could benefit the members and the organization. This is not only satisfying, but helps the incumbent to leave a fingerprint that is indelibly unique. What has it been for you? JB: To begin with, the industry downturn has certainly had an impact on my objectives as president; however I think it provides an opportunity to be more impactful than might be possible during the good times. As we struggle to cope with the financial situation, it is forcing us to rethink our long term strategy, and ultimately I think that this is a necessary and beneficial exercise for the organization. Beyond the industry downturn, a number of external forcings are altering the way we do business and how we can best serve our members. The recent COP 21 agreements on climate change are indicators of the political changes to come with regard to energy policy. This is coupled with the fact that many of the major oil companies now have a public statement on climate change that clearly acknowledges the need to limit CO2 emissions. These are clear indicators that we are headed for a new energy economy that will have a major impact on our members. Additionally, the rapidly growing population, which is projected to reach around 9 billion by 2050, means that our life-sustaining resources such as fresh water are going to be increasingly stressed. Applied geophysics has a role to play in understanding and managing all of these issues, and SEG needs to adapt to these changes in order to remain relevant to our members and society as a whole. RN: For me, this was not a year of ambitious measures but more so of working through the most significant industry downturn that has ever been experienced by many of our members. We have spent considerable time in the executive team formulating methods to support un- or under-employed members, ensuring that key activities and services continue to be funded and working with our corporate members and supporters to ensure value. One of our key changes has been to relocate the CSEG monthly technical luncheon to a smaller, cozier, more central and affordable venue, allowing us to reduce the cost to members and corporate sponsors. Personally, I focused on volunteers and member engagement in the society by taking time to meet personally with committees and individual members, by directing the CSEG RECORDER President’s Message towards issues that would help members, and by truly enjoying the interaction with members that encouraged them to call me personally with comments and concerns. Many more members called than I expected! At the monthly technical luncheon, and various events, I took a few minutes to reiterate messages of support, professionalism, engagement, losing the entitlement, resilience in a downturn, and advocacy for yourself, your company, your profession, and your industry. MA: On the internal front, a number of administrative measures aimed at streamlining and smoothing the daily operations within EAGE have recently been introduced. Here, two governance documents have been approved by the board. One stipulates the bi-lateral decisionmaking process between the board members and the board of directors, the other prescribes the relationship among the board of directors themselves. A set of norms that regulates the relationship among board members has also been adopted. Finally, a code of conduct, applicable to all EAGE board and staff members, has been endorsed by the board. Also, a number of cost-saving measures have been imbedded into our operations to help alleviate the impact of the current economic downturn. In the geoscience and engineering arena, and under the auspices of our Oil & Gas Geoscience Division, we have just launched a new, but rather timely, entity referred to as the Resource Evaluation Committee. With most ground resources, and in particular hydrocarbon reservoirs, becoming increasingly mature and/or more complex, new technologies are constantly being developed to maximize the yield. Realizing the big influx of new technologies into our business, a main charter of the newly formed committee is to help assess the impact of those technologies on the estimation of relevant assets buried in the subsurface. The committee also aspires to increase the awareness and competence relating to the classification and categorization of reserves and resources in general. JH: It’s been a difficult year for all association and societies. Many of the not-for-profit groups are in the red today, due to the downturn in the industry. My work this year has focused on two items for AAPG: reduction in capital costs and reorganization of AAPG to run more like a business, in support of the membership. To that end we have focus on optimizing AAPG’s business operations. AAPG is a business, and though we are a non-profit, we must run efficiently. So, we need to focus on our members and customers. AAPG has a strong constituent base of members, associates, and students. We also have many customers, such as the sponsors and exhibitors, and a significant number of non-member geoscientists who support our activities. Better serving our members and customers is our primary goal. In difficult times AAPG needs to focus on relevance; we must evaluate everything AAPG is doing, both from a business standpoint and programmatically to ensure that what we are offering our members and customers is relevant to them during this industry downturn. NM: SPE doesn’t change overnight. We are in the process of SPE 2.0, a society that really caters to its members and leverages technology. I think we have made a far greater investment in technology that our peers and we continue to push this forward. I have focused on students and stressing the role energy plays in improving people’s lives. What message would you like to give to the geoscientific community across disciplines through this interview? JB: As we all struggle through this downturn, the professional societies are working hard to make sure that we continue to provide the most valuable programs and services to our members. Additionally, we are doing as much as we can to assist recently unemployed members. While the landscape for the professional societies is going to look different when we emerge, strength comes through overcoming adversity, and I think that we will be a stronger, more efficient, and more relevant organization for having gone through these tough times. RN: Creative collaboration is the key to success. MA: One final note during this difficult period. I appeal to all stakeholders in our industry not to downplay the importance of R&D. Specifically, I would strongly advise against allowing the R&D staff of our industry to become one of the first corners to be cut in this tough economic downturn. R&D is the shop that cheaply generates innovative ideas that may enable us to reach the as yet unreachable. Be warned, too, that R&D staff may never return to our industry once let go. JH: If I can say one thing to readers, it’s get involved with your local affiliated society, your national and international associations, and give back to your profession. If you are a scientist, publish, give short courses, become an editor. If you are an industry professional, publish, run a short course, visit a university and give a talk, meet with young professionals and mentor. Students and young professionals enjoy meeting professionals who are in the industry; their understanding of the science we do is immature, as most universities around the world have very few professors who have spent time exploring for or developing natural resources. There’s much to do; there are opportunities for all professionals to get involved and give back to your profession. NM: The real determinant of success in life and of character is not the way we react when everything is going our way or when our environment is particularly easy. It is how we respond to challenges and difficulties. I realize the difficulty of current times, but this may very well not be the biggest hurdle we face in our life. I believe our industry is critical to providing safe, affordable energy. This really improves the quality of life for billions of people around the globe. We will also play a vital role in sustainable development. I am further convinced of a fact geoscientists are unlikely to dispute: engineers can’t do it all! In fact, without geoscientists we simply cannot get a correct answer. We all need to work together because what we do is important: it improves human life.